Mat Weisfeld has been busy at VPI in creating new products and updating the companies current products in celebration of VPI’s 40th anniversary. The VPI Prime Scout replaces the longtime production model, the Scout. The changes made are a welcomed improvement, offering a new quieter motor and better. The new Prime Scout features a new and improved motor with an aluminum platter replacing the acrylic platter found on the Scout. In addition, the new cue mechanism is now made in America, and still standard on the table is the JMW 9 inch uni-pivot tone arm. The new base is attractive and also has better feet making adjustments and leveling the table easily. Listening to vinyl since 1979 has not made my mechanical skill regarding setup of tables any better. Once I returned from VPI with the table, I had issues with tuning the Prime Scout to my system. Calling Pat Matucci from High Fi Sales, a longtime established dealer in Cherry Hill NJ, for his professional help with the setup, Pat offered to come over and set up both cartridges and to make sure that the table was functioning to its maximum capability. Pat is masterful at his craft and set the VTA for both the Grado and the Orotfon cartridges so all I had to do for this review is to swap the identical arms in and out. He set the tracking for both cartridges and made sure the table was working perfectly and ready for serious listening sessions. Now that the table was setup and connected into the system using the VPI 229D amplifier, with its internal phono stage. I used the Nordost Blue Heaven between the table and amplifier and sat down and started listening with both reference headphones and the Fritz Carbon 7SE monitors starting with the Grado labs Black. When I entered this hobby in 1979 my first turntable was a NAD, which I had purchased and had a $50 Grado Black cartridge installed on the stock arm. While the table was not the best offering in high end; it was the beginning of my lifelong entry into high-end audio. The Grado was a warm inviting cartridge that sounded better than anything I had used growing up with in the all on systems my Dad had bought. The cartridge had excellent soundstage and female vocals were astonishing. The sound was magical and the soundstage was exceptional, especially for the price of the cartridge. Sheffield Labs was busy recording artist direct to disc on virgin vinyl, and I purchased the Amanda Mcbroom “Hollywood “ album with Lincoln Mayoga and the sound from the Grado Black was sensational. Amanda’s vocals were in the room and sounded live and focused within the soundstage. The album was my first audiophile pressing and cost $15 back then in 79. Listening to Pink Floyd’s Dark Side of the Moon on a Mobile Fidelity pressing back then, and still, makes music come alive, especially on the track Money. The Grado cartridge delivered exceptional treble with its magical midrange. Bass was also excellent. The Grado Black2 cartridge over 40 years later is priced at $75 and is an entry level design still hand made in Brooklyn by the skilled workers at Grado labs. I started to get excited when Pat started to mount the cartridge as it brought back memories from 1979. I remember those days and could not wait to hear that magical Grado sound. Listening to Louis Armstrong’s album “Satchmo Plays King Oliver” one of my favorite albums brought back memories and took me back to the early days of my vinyl listening experience. Pat Matucci and I listened to the recording and could not believe how quiet the Grado was playing the record . The sound had that traditional Grado house sound which is warm and musical. The Grado cartridge on the Prime Scout was dead quiet. The soundstage had the focus and depth and width and was exceptionally good for a cartridge priced so inexpensively. The vocal recording of Frank Sinatra sounded as if he was in the room and both Pat and I were impressed with the music the Grado was making. The imaging of the master vocalist was in a defined space with the orchestra around him in a soundstage defined with air and space between the performers. Pulling out the Mercury recording engineered by Wilma Fine “The Firebird” is challenging for most systems. The recording has some interesting dynamic passages in the music and I was curious to hear how the Grado Black would respond to this demanding recording. The soundstage was wide and images within the soundstage were all layered. The cartridge was still quiet and the sound was excellent. And the imaging was good with each section separated and layered within the stage. The Grado sailed through the dynamic climax and delivered a believable performance . The Grado Black never embarrassed itself and was able to reproduce vinyl recordings with a quiet and musical presentation. Tonality of instruments was excellent and the sound exceptional especially for a cartridge priced so reasonably. Using the same recordings as I did with the Grado cartridges to see and notice differences between the two cartridges I switched the arms both being identical with the Ortofon Black installed and began listening. The differences were noticeable and expected since the Ortofon was priced 10X more than the Grado. Noticeably better with the Ortofon was the soundstage expanded and had more air while listening to Louis Armstong “Saint James Infirmary”. The imaging was pinpoint and created a much more in the room feel. The focus of Armstrong’s trumpet was better focused within the soundstage; there was noticeably more air and space between musicians. Bass had better texture and the Ortofon tracked extremely well and was quiet while playing the same albums. “The Firebird’s” dynamic swings were reproduced easily and the orchestra layering had more pinpoint focus and layering than the Grado Back. Vocalists were set in the stage and there was more air and space between the musicians. There was a big step up in retrieving inner detail from the vinyl recordings. The treble was exceptionally clean and realistic. Switching from 33-45 recordings was a breeze. The belt is moved to the lower part of the pulley and your ready to go with your favorite 45 recordings. Listening to “Harry Belafonte Sings the Blues” was another revelation. The sound was incredibly transparent and Belafonte’s vocals were clear and articulate. The sound of Belafonte felt as if he was in the room and the Prime Scout with the Ortofon Black was able to recreate the performance and make it sound as if I was at a live performance. Amazing sound that never faltered and made the listening experience special and complete, something that digital recordings cannot equal. Was the Ortofon ten times better than the Grado Black? Differences were noticeable but the Grado Black never embarrassed itself and had excellent sound. The Grado for the price is an exceptional cartridge and compared well, but the Ortofon extracted more detail and had better imaging, to be fair the Grado higher end cartridges would be a better comparison and the Sonata V2 should be closer to the sound of the Ortofon 2M Black and will prove to be an interesting review (in house). The Orotfon Black is a cartridge that has exceptional transparency and was able to extract inner detail making the listening sessions enjoyable. VPI has been making quality turntables for 40 years now and for vinyl music lovers a company that has achieved legendary status. Harry Weisfeld continues to tinker and creates new designs and Mat Weisfeld’s leadership has taken VPI to the next level. I started my love for VPI back in the early nineties with the HW 19 which is now a classic table. 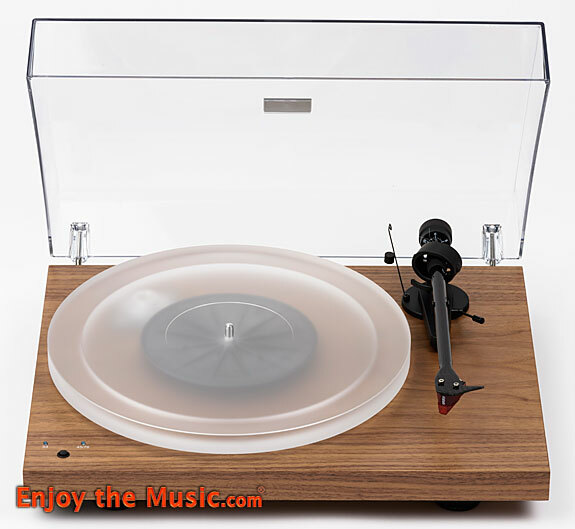 The VPI Prime Scout with its new motor and plinth makes the table much quieter to listen to over the previous Scout with its new base and quiet motor. The impressive Prime Scout sits on the top of my rack in my listening room and is easy for me to access and an attractive tabletop piece for my listening room. While digital recording and streaming are easier to access and convenient, the recordings still are not equal to the sonics vinyl records are capable of delivering. The sound of analog recordings are much more relaxing’ and have a human quality to the sound that digital still has not been able to surpass. Missing in long listening sessions are headaches and for me the sessions are always more rewarding while the black disc are spinning. Long evening hours of listening to vinyl on the Prime Scout transpired into early morning hours. The live sound coming from the Prime Scout had me totally consumed and I especially enjoyed the sound with its exceptional midrange. Bass and treble extension is excellent and with large scale recordings the climax on finales was dynamic and eventful. The treble extension was excellent as was the bass which were both impactful and delivered excellent texture of the instrument. Jazz recordings with horns never were harsh and always musical. The detail retrieval had the artist in their own space with excellent air and space. On classical recordings the Prime Scout delivered excellent layering with pinpoint imaging between the orchestra. I was impressed with how good the imaging was with exceptional layering and it was 3D. The speed and dynamics were explosive at times and provided a realistic listening experience with the large scale fast finales. VPI is a company that is committed to bringing the world the best vinyl playback products. The company manufactures tables from $900 – $40,000 and the Prime Scout sitting at $2199 sits at a sweet spot and offers exceptional sound and is built like a battleship and designed to last a lifetime and adding a quality cartridge for under $800 elevates the Prime Scout to a reference quality table that delivers exceptional musicality. Whether I was using the Grado Black $75 cartridge or the Ortofon 2M Black cartridge the Prime Scout always delivered a magnificent performance and made the music come alive. The Prime easily let me hear the differences in the more expensive cartridge and always had me totally consumed with its presentation no matter which cartridge was spinning vinyl. Mat Weisfeld continues to revamp the VPI products and is constantly trying to improve upon classic designs with easy to use designs. The company builds all their products on Cliffwood New Jersey by hand with dedicated employees who are devoted to building the best products. The Prime Scout continues the fine VPI tradition of tremendous value. Built to last a lifetime the VPI Prime Scout never misses a beat. The sound is always reference quality and outperforms all my higher priced digital gear. The sound of vinyl is human and realistic and always makes the listening sessions an experience that is immensely enjoyable. While listening to recordings with the VPI masterpiece, I was totally into the music and never felt cheated with a performance. Beautifully designed and delivering exceptional musicality the Prime Scout continues the VPI tradition of delivering outstanding products at real world prices. If you are in the market for the best in vinyl reproduction check out the Prime Scout as it delivers exceptional musicality and a new benchmark product from VPI. Frank started his journey in high-end audio in 1978 and was quickly hooked. Frank’s passion for music and great sound reproduction is stronger than ever. His main focus is with high-end headphones and portable related gear. He is a regular Head-Fi.org contributor and is a co-founder of Headphone.Guru.